Originally published under the title "Israel's Virtual Security Zone." 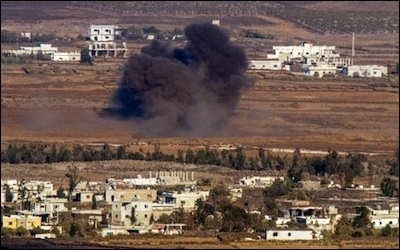 Smoke rises from a Syrian village near the border with Israel, as seen from the Golan Heights, September 8, 2014. Cautious and prudent Israeli policy has largely succeeded over the last five years in sealing off the Syrian civil war from Israel's territory. This has been achieved through the careful cultivation of a working relationship with rebel militias on the other side of the border, along with a readiness to act decisively on occasion to neutralize emergent dangers. There has been a notable uptick in border incidents in recent weeks. Then on the 18th, a drone was dispatched across the border to Israel. Israeli attempts to down it were unsuccessful. 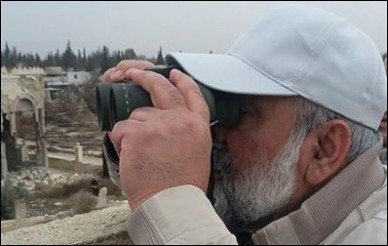 Gen. Mohamed Reza Naqdi touring the Syrian-Israeli border region last month.